HonorBound (RPG hack) by JuiceBox Games is an enjoyable turn-based adventure with a story revolving around heroes coming together to save the land from witches, zombie hordes, and other dark forces. 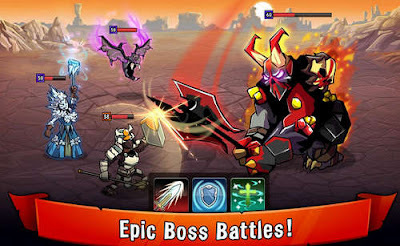 Players can choose to play with one of 5 available characters (elemental heroes) before going on quests to bring back order to the land and do away with chaos. You must be smart on how you create and lead your squad of warriors though. Every character has their own skill and powers useful for different battle situtations. You can also summon an archer, wizard, and many other powerful heroes to help you fight your enemies. Using the HonorBound Modded Apk will even render your enemies weaker so you can destroy them with 1 hit. Now scroll down to download this monster-capturing, team-building, epic fighting game! Uninstall Play Store version and Install modded one. for some reason your character has Low HP, just Click Continue Then Exit in MAP to Regain the HP. Install Original APK if the sequence is that the enemy will attack First.